Three-dimensional printing has accomplished many victories in the medical world, making it an asset to the industry by changing lives every day. Both FDM-based and PolyJet technology are frequently used in the medical field, and the more we use 3D printing technology to advance medical sciences, the more life-changing the results become. The following examples are created using Stratasys 3D PrintingÂ systems, unquestionably delivering the highest quality and versatility for medical use. Here are just a few of the medical worlds best applications, picked by SYS systems, where additive manufacturing has been used to save lives and improve quality of life across the world. 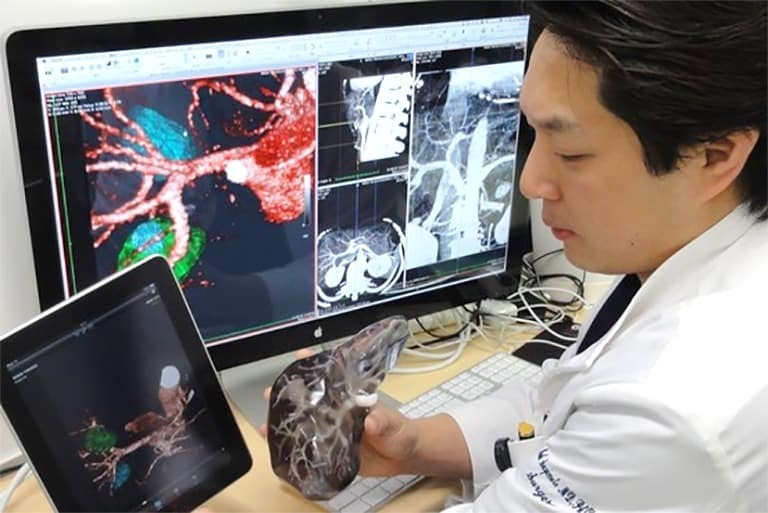 Kobe University Hospital in Japans Kansai region, has incorporated 3D printing technology into their medical approach by producing model replicas of patients organs in order to save lives and educate the doctors of the future. Installed in 2014, the Objet500 Connex3 colour, multi-material 3D printer can create full-sized models of internal organs eliminating errors and misreading of traditional operation plans based on 2D CT and MRI scans. Not only does this drastically reduce operation time, but the 3D printed models can also be used as a tool of communication between doctor and patient, allowing them to fully understand the operation process and procedure. The 3D model offers a greater insight of the problem, with its multi-colour and multi-material properties it can illustrate problems that 2D scans may not. Using bio-texture modelling allows doctors to replicate the organ in materials that can be used to simulate surgical procedures. Doctors and students alike can study the organ model, identify the appropriate treatments, and determine the best surgical method. Medical trainees at Kobe University Graduate School of Medicine reap the benefits of this revolutionary techno-medical approach through using the models to practice resecting and stitching organs on surgical navigation systems, allowing them to harness real-world surgical techniques confidently. The Objet500 Connex3 offers more than just freedom of design, material diversity in colour, strength and durability, it offers the chance to change and save lives around the world. And as a result 3D printing technology can offer medicine a clearer perspective prior to operation reducing time, risk and error, thus extending the techno-medical boundary further than ever before. The same method was used in saving Mia Gonzalezs (above) life in Miami, when she arrived at Nicklaus Childrens Hospital having been misdiagnosed with asthma. 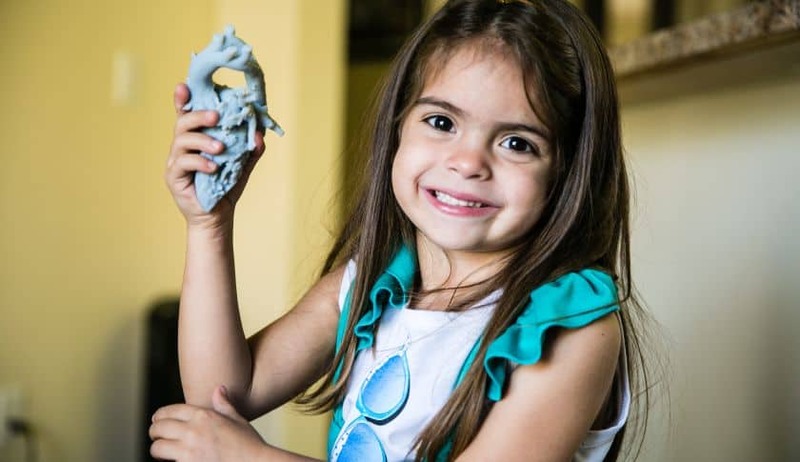 The doctors there created an anatomically precise 3D model of her heart, discovering a structural heart defect in which a complete vascular ring was wrapped around her oesophagus, resulting in difficulty breathing and struggling to swallow. 3D printing can be used not only to determine the course of action in surgery but can also be used to eradicate medical anomalies. Having an exact replica of Mias heart helped the surgical team to visualise the operation process before it was executed and thus, with the use of a Connex3 machine, doctors were able to perform the operation with confidence. Where life-saving skills are imperative, training is vital. It is argued that traditional airway trainer manikins do not closely replicate the human anatomy and therefore cannot prepare medical personnel adequately in any field for life-saving procedures. The University of Minnesota Medical School, in a U.S. Army funded study, is developing anatomically accurate airway trainers to improve training for medical emergencies. Preparing army medical personnel with the best possibly training in order to save more lives. To do this, firstly the university obtained MRI and computed tomography scans of human airways, taking data from evaluating and redefining their findings in order to generate CAD files. Then using the Stratasys Fortus 250mc 3D printer they were able to build a skeletal structure model, including the skull and jaws. Moulds were then created to generate soft tissue models out of silicone rubber. They then used the Objet350 Connex3 machine, for its capabilities in multi-material printing, to produce a realistic replica of the cervical spine. As a result the 3D printed manikin prototypes, delivered to the U.S. Army Research Laboratory office in Orlando, closely simulated live human anatomies in geometry and materials, which closely simulated human tissue. The 3D models provide an accurate representation of physical human characteristics, which could aid in future life-saving training due to their physical properties being as realistic as possible without being human. This means more lives can be saved by learning with these prototypes that any other model of air trainer. Not only will these 3D prototypes eliminate inadequate emergency personnel training by providing a much more realistic manikin, but they will also help to shape the approach toward medical emergencies in the future. Restoring or improving an individuals quality of life is another way three-dimensional printing can be beneficial. Most procedures and solutions to medical anomalies or injuries including lost limbs, fractured bones and missing body parts will cost a fortune to resolve. 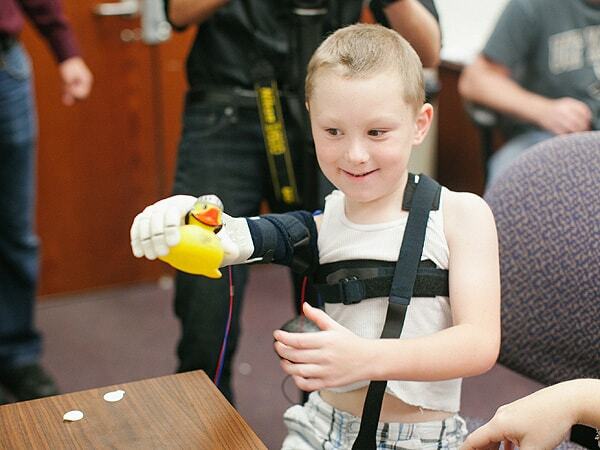 Thats what six-year-old Alex Prings mother thought when he was born without a lower right arm. From Groveland, Florida, Alyson Pring discovered Enabling the Future, a global volunteer community dedicated to helping children with limb deficiencies by providing 3D printed prosthetic limbs. Through Enabling the Future, Albert Manero, a Ph.D. student in mechanical engineering at the University of Central Florida, offered his help by designing a highly functional replacement limb for Alex at a much lower cost. Manero and his team set about using the FDM-based Dimension Elite 3D Printer to prototype using ABSplus material, for strength and functionality. With the Dimension 3D printer this process took just eight weeks. Additionally the final prototype boasts an electromyography sensor inside the arms shell, coupled with a microcontroller, allowing Alex to open and close the printed hand by flexing his bicep. While Velcro straps secure his arm into a socket with a diabetic sock, allowing movement and breathability with minimal risk of skin abrasions. 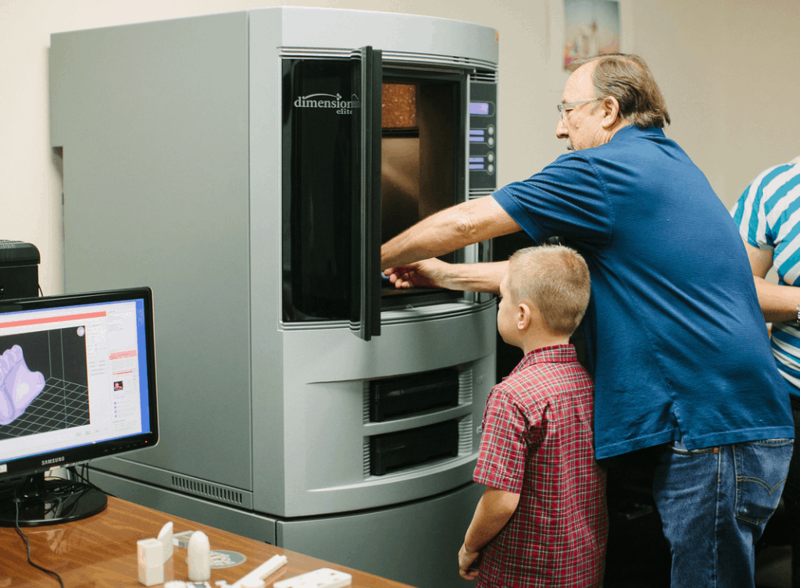 The Dimension Elite FDM-based 3D Printer offers functional, durable 3D models allowing the prototypes to not only be examined but also tested and used in end products. Offering nine varieties of colour in ABSplus material allows customisable results which means that the bionic limbs created by Manero can be to the childs preference. FDM (Fused Deposition Modelling) creates strong, long-lasting components making it ideal for the manufacturing of Enabling the Futures limb prosthetics. Due to his age, Alex will need updates as he grows but in comparison to traditional medical practices this solution was inexpensive and will continue to be with the use of 3D printing. 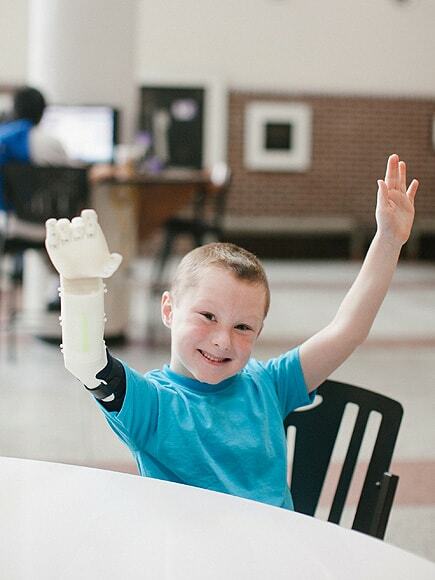 Manero has inspired hope amongst children with limb deficiencies and his team aims to help many more across the globe, after transitioning into the non-profit Limbitless-Solutions, they continue to work with institutions around the world in order to bring 3D printed solutions to children in need. Want to find out more about 3D printing?